Do you recognize these residents? I do. They live in multiple communities across the country. Or at least they appear to. It seems they’re meant be the image of the ideal resident based on how many times this photo has been featured in marketing materials. 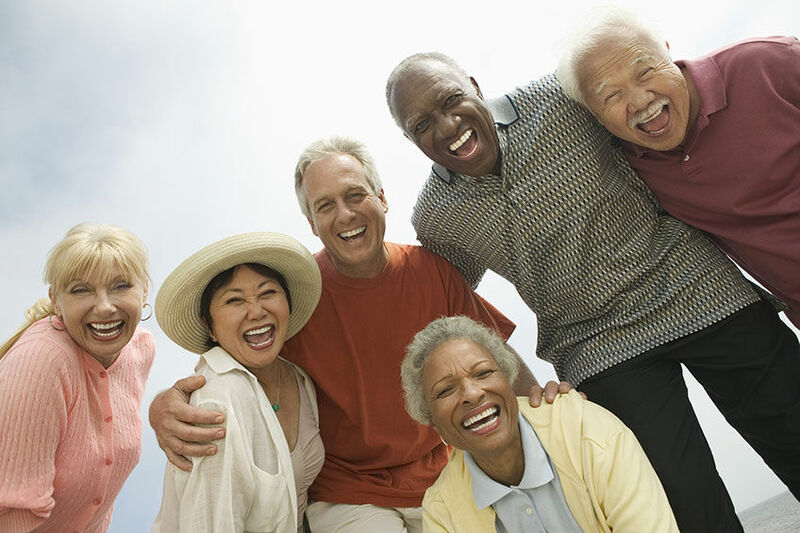 I think this may be one of the most overused images of happy, multi-cultural, young, smiling seniors I have come across in the last several years. Let’s retire them. Better yet, let’s retire stock photography altogether in the senior living industry. Why? Because you have beautiful, vibrant residents who would be more than happy to represent their community and elevate your messaging game to a whole new level. Why is there such a high incidence of the use of stock photography in senior living? Is it because it’s inexpensive and easy? I get that. It takes time and money to hire a photographer, schedule the photo shoot, arrange your models, and make sure the color, lighting, location, and atmosphere capture the essence of the message you’re trying to convey. It’s hard to find time and money to go through all this hassle. But it’s more than worth it. If you do, nobody will have the same photos you do. The residents above can continue to reside at several communities across the country, just not yours. Is it because your community isn’t quite diverse enough? This one is a little more challenging. Some communities have done a great job in overcoming these old philosophies. But it’s a slow process. Despite being truly inclusive, (and I know communities are and desire to be), it’s an uphill battle to truly become culturally diverse and it takes a long time. Colleges and universities used to have to work just as hard to overcome the same challenges. They got there. So will you. In instances where your resident population doesn’t quite represent who you are striving to be, you can hire models and photograph them in that amazing on site photo shoot you’ll do to eliminate the use of the picture above. Is stock photography so popular because we don’t want people to see how old the population at our community really is? The reality is that the average age of your senior living resident is 85. If you’re lucky, and an active life plan community bursting with amenities appealing to younger seniors, you have an average entry age of around 74. In this industry that is young. So, by all standards and the average sales cycle, clearly the target audience can range from 65-75 years old. Obviously when we narrow down these demographics, it does become increasingly more challenging to find models in our own communities. But they are there. And they are thrilled to be asked to be part of promoting your community. Your residents, who are your biggest advocates, and by the way your best sales people, are the best choice for authentic photography to grace the cover of your magazines, your website, and the community marketing materials. The biggest keyword in this is AUTHENTICITY. Consumers today clamor for authenticity and can smell a fake a mile away. Don’t diminish the value your amazing residents can provide with the glow of happiness that radiates off the pages of your marketing materials. Authentic experiences make for honest story telling. And isn’t that what marketing is all about? Telling the story of your community through pictures and words? So where do you find the right residents to invite to this photo shoot? Ask your sales counselors. Walk through your community buildings. Seek out residents with diverse interests, backgrounds, and hobbies. Diversity is more than just color. As I was searching for the right way to convey by belief in diversity, I came across this fabulous quote that sums it up perfectly from Denise Young Smith, VP of Worldwide Human Resources at Apple. Diversity is more than any one gender, race, or ethnicity. It’s richly representative of all people, all backgrounds, and all perspectives. It is the entire human experience. Want to show diversity in your photos? Showcase the human experience at your community. And please, ditch the stock photos.